Background: Stress can be described as a dynamic and reciprocal relationship between the person and the environment. Nursing is an occupation with a constellation of circumstances leading to stress. Work-related stress (occupational stress) can be damaging to a person's physical as well as mental status, which directly and indirectly affecting their quality and productivity of work. Hence, an attempt has been made with an aim to assess stress-perceived stress among staff nurses in Mysore city, India. 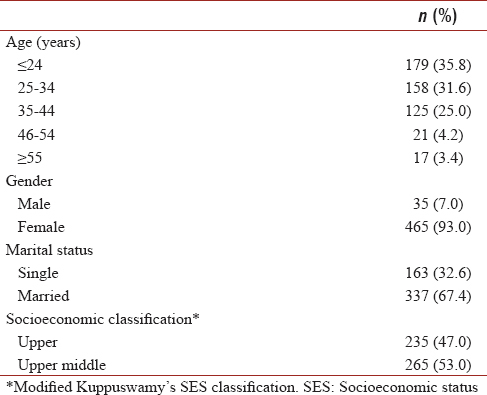 Methodology: The descriptive cross-sectional study was conducted among 500 staff nurses selected from eight hospitals in Mysore City, India, using multistage sampling technique. Study duration was 5-month period and response rate was 100%. A structured questionnaire was administered to assess stress using Perceived Stress Scale (PSS) and Expanded Nursing Stress Scale (ENSS). Results: A cross-sectional study consisted of 500 staff nurses. Majority of the participants (467 [93.4%]) had diploma and 454 (90.8%) nurses worked on day shift. Nearly 277 (55.4%) had a moderate level of perceived stress and 249 (49.8%) had moderate occupational stress. Significant positive correlation (r = 0.144, P < 0.001) between ENSS and PSS. Conclusion: A positive correlation was found between perceived stress and occupational stress among staff nurses of Mysore City. This shows that those with general stress also have occupational stress. An indirect role of psychosocial stress through behavioral changes: psychosocial stress may have an indirect role through changes in the health behaviors. Stress may affect at-risk health behaviors such as smoking, alcohol consumption, neglect of oral hygiene, or poor compliance with dental care., This influences not only the decrease of the frequency as well as the quality of the dental hygiene but also the increase of tobacco use, changes in food habits, or overeating, especially a high-fat diet which then can lead to immune suppression through increased cortisol production, leading to a diminution of the general health. Stress, depression, and anxiety are not yet confirmed as absolute risk conditions but have been identified in some observational studies,,,, as potential factors that may affect disease. The potential negative influence of stress on medical health in general and on specific diseases, in particular, has been subject of extensive research. The stresses evaluated in this study were perceived stress and occupational stress measured by Perceived Stress Scale (PSS) and Expanded Nursing Stress Scale (ENSS), respectively. Occupational stress was assessed because according to the WHO report, “Raising Awareness of Stress at Work in Developing Countries” in 2007, and it is one of the most common forms of stress in developing countries as the socioeconomic states, social inequalities, and overpopulation forces employees to work based on job availability without a choice. People with different jobs encountered different types and quantities of stress. Selye indicated that nursing is one of the most stressful professions. Nursing is an occupation with a constellation of circumstances leading to stress. Nurses were selected for the study because nursing is an occupation with a constellation of circumstances leading to stress. Stress affecting nurses across the globe has been convincingly documented in many literatures.,,, Nurses in India are overburdened as the nurse-to-patient ratio is low (1:2250). They are responsible – along with other health-care professionals – for the treatment, safety, and recovery of acutely or chronically ill, injured, health maintenance, treatment of life-threatening emergencies, and medical and nursing research. Nurses do not only assume the role of caregivers but are also administrators and supervisors of patients. These multiple work roles contribute to the significant amount of occupation-related stress among nursing staff, particularly those working at the bottom of the hierarchy such as staff nurses and nursing sisters, who end up sharing most of the work burden. Shift duties, time pressures, lack of respect from patients, doctors as well as hospital administrators, inadequate staffing levels, interpersonal relationships, death of patient, and a low pay scale significantly add to their stress levels. These factors are intrinsic to nursing and are compounded by environmental factors such as difficult patients and their families, relationships with physicians, low institutional commitment to nursing, and the delivery of poor quality care. Research has shown that nursing is a high-risk occupation in respect of stress-related diseases. 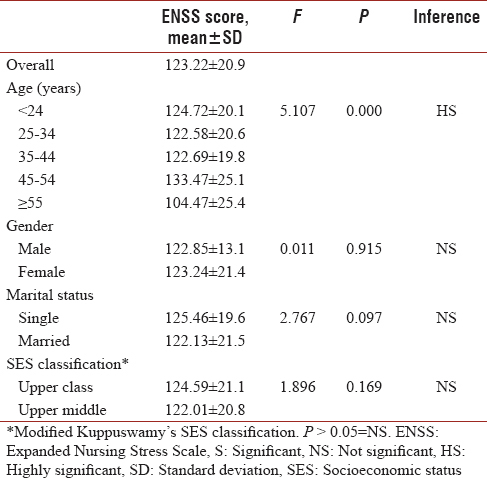 Hence study had assessed the stress among nurses by using Expanded Nursing Stress Scale [ENSS] and Perceived Stress scale [PSS]. Stress-related studies were less among different occupations in Mysore city. Hence, an attempt had been made to assess the level of stress among staff nurses in Mysore city. Descriptive, cross-sectional study was undertaken to assess the stress among staff nurses in Mysore city, India. This cross-sectional study was conducted for a period of 5 months among the staff nurses in Mysore city. Sample size for the study was scientifically determined based on the data obtained from a recently published scientific article. Study population was selected on the basis of multistage sampling technique. Moreover, for the selection of nurses from each of the hospital, the attendance register of the nurses was used. A list of hospitals in Mysore city was obtained from the district health office. Eight hospitals were shortlisted for the study by simple random sampling method because of logistics reasons and approached for permission to conduct the study. After the permission was granted, the nurses of these hospitals were considered for the study. ni= Number of nurses selected from strata. [Table 1] shows the proportional allocation of staff nurses among selected hospitals. Nurses who were willing to participate and present on the study schedule day were included in the study. Those using anticonvulsive, immunosuppressive, calcium-channel blockers, pregnant, and nurses in management position were excluded from the study. The ethical clearance was obtained from Ethical Committee of Institution. Permission to conduct the study among staff nurses was then obtained from the directors of the respective hospitals. All the participants who were recruited for the study were explained about the purpose of the study. The research subjects were assured that the information collected from them will be kept confidential. Informed consent was then obtained from the participants. Questionnaire consisted of questions regarding demographic and socioeconomic information (based on Modified Kuppuswamy Socioeconomic Status Scale), questions concerning their medical history, diagnosed systemic diseases, and medications taken on a regular basis, history of tobacco, and alcohol consumption. 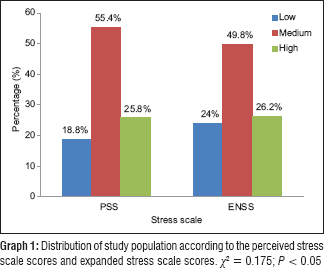 Stress was measured using two stress scales: PSS and ENSS. PSS is developed in 1983. It is one of the most helpful five-point Likert scales used to understand how different situations affect our feelings and our perceived stress. 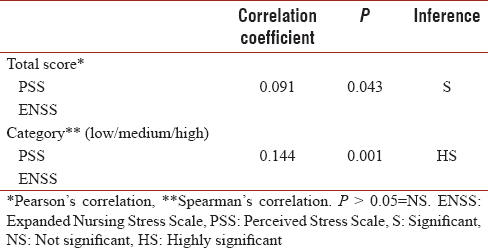 The PSS predicts both objective biological markers of stress and increased risk for disease among persons with higher perceived stress levels. For example, those with higher scores (suggestive of chronic stress) on the PSS fend worse on biological markers. The scale is designed to measure nurse stress levels. The ENSS (French et al.) consists of 59 items with response options in a Likert-like format (1 = never stressful, 2 = occasionally stressful, 3 = frequently stressful, 4 = extremely stressful, and 5 = does not apply). From pilot study sample, Pearson's correlation coefficient for the test–retest reliability of the PSS and ENSS was 0.83 and 0.78, respectively, showing good stability. The understanding of all the items in both questionnaires was found to be correct for all pilot subjects and no modifications were necessary. The participants who participated in the pilot study were not included in the main study. The questionnaire was administered to the participants and was explained by the investigator before the participants started answering it. On an average, it took 20 min to answer the questions. Statistical analysis was done using computer with Statistical Package for the Social Sciences (SPSS, Inc., Chicago, IL, USA) version 17. The various parameters used for the purpose of analysis were frequencies, arithmetic mean, standard deviation, t-test, and analysis of variance. For the purpose of analysis, the individual scores were summed up to yield a total score. The range of PSS and ENSS scores was divided into stratified quartiles to develop an ordinal scale.,, The stress score was stratified into low stress (first quartile), moderate stress (second and third quartiles), and high stress (fourth quartile). Probability levels at P < 0.05 were considered statistically significant. The study was conducted to assess the stress and how it is perceived among the staff nurses in Mysore city. A total of 500 nurses were included in the study among that 93% were females and 7% were male staff nurses. Regarding marital status, 67% (n = 337) were married and 33% (163) were single. [Table 2] shows demographic details of the study population. Majority of the participants 467 (93.4%) had diploma, 454 (90.8%) nurses worked on day shift, 352 (70.4%) worked shift for 8 h, 383 (76.6%) had patient assignment of more than six patients, and 273 (54.6%) had work experience of 1–10 years [Table 3]. [Graph 1] shows majority of the participants (277 [55.4%]) had a moderate level of perceived stress and 249 (49.8%) had moderate occupational stress. [Table 4] shows a significant positive correlation (r = 0.144, P < 0.001) between ENSS and PSS. There is a correlation between occupational stress and general stress. 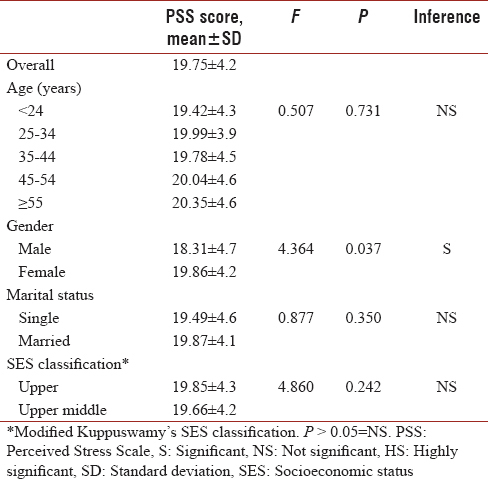 [Table 5] shows that females had significantly (P < 0.05) higher mean PSS stress score than males, but there was no significant difference between PSS score and age groups, marital and socioeconomical status. 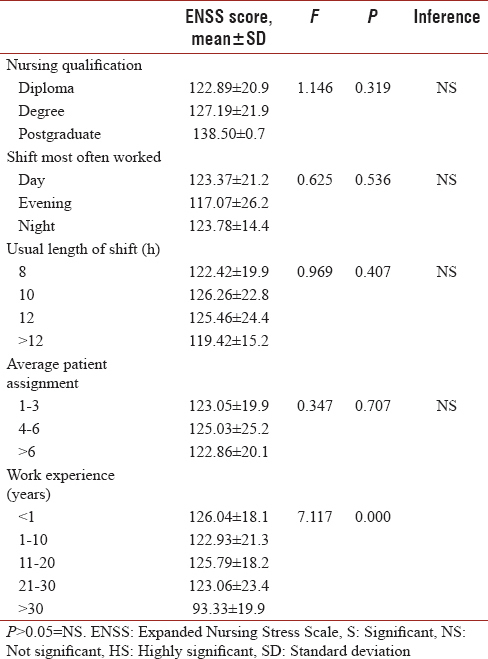 [Table 6] shows that mean PSS scores of participants with average patient assignment of 1–3 (21.00 ± 5.1) were statistically significant where no statistically significant difference between PSS score and nursing qualification, usual shift most often worked, usual length of shift, and their years of experience. [Table 7] shows that statistically significant difference (P < 0.001) was found between the mean ENSS score of all the age groups. However, no significant difference was found between ENSS scores and gender, marital and socioeconomical status. [Table 8] shows statistically significant difference between ENSS score and years of experience. Participants with <1 year of experience had the highest mean ENSS score of 126.04 ± 18.1. PSS was used to assess the perceived stress as it is a global appraisal scale Cohen et al., designed to measure the degree to which individuals found their lives to be unpredictable, uncontrollable, and overloading. The PSS was selected because it has been found to better predict stress-related psychological symptoms, physical symptoms, and health service utilization compared to commonly used life event scales. A significant positive correlation (r = 0.091, P < 0.05) was found between the total scores of ENSS scores and the PSS scores. When taken as categorical variable, it remained statistically significant (r = 0.144, P < 0.05). It indicates that the increase in the score of one scale also results in the increase in the other. Similar findings were found in a study conducted by Purcell et al. In our study, the mean score on the occupational stress was lower in the older age group of more than 56 years of age. This indicates that older nurses had significantly lesser occupational stress compared to the lower age groups. This finding is in line with the study conducted by Purcell et al. and Shen et al. This might have occurred since they are not skillful in coping than the older groups. However, there was no significant difference between the perceived stress scores of all the age groups. A similar finding was seen in the study conducted by Purcell et al. The mean stress score on the nursing stress scale was not significantly different between the males (122.85 ± 13.17) and the females (123.24 ± 21.44). This finding is consistent with a study conducted by Watson et al. and ALnems. No differences were observed on occupational stress and perceived stress by marital status. This finding of our study is consistent with the studies conducted by Sveinsdóttir et al., Bhatia et al., and Sharifah et al. However, contrary results were found in a study conducted by Shen et al. were the separated/divorced nurses had higher stress compared to those who were married or single. Perceived stress was not significantly associated with socioeconomic status which was found in other study. In our study, the occupational stress score statistically significant difference (P < 0.001) with age groups and years of experience. This shows older people have the ability to overcome the stress with their experience. They will be well aware about the stress-related situation with their experience. Occupational stress showed no significant difference with the level of education. Contrary results to this finding were found in other studies conducted by Hamaideh et al., wherein association was found between the level of qualification, shift, and nursing stress. In a study conducted by Sveinsdóttir et al., occupational stress had no association with the level of occupational stress which was in line with our study. There existed a significant difference between the scores of the occupational stress and the years of experience with lesser score among the nurses who had experienced more than 30 years. Nurses had a moderate level of occupational and perceived stress. The study assessed significant positive correlation was found between the total scores of ENSS scores and the PSS scores. It indicates that the increase in the score of one scale also results in the increase in the other. The limitation of the study is that it should have been done with comparison group or association with stress-related disease. Further studies with a longitudinal approach relating stress and major oral disease should be conducted to establish a causal relationship between potential stress factors and any stress-related diseases. Studies using biochemistry markers, psychological assessment, and multiple measurements of variables should be considered to clarify the role of psychosocial factors and their mechanisms of action. Selye H. Stress in Health and Diseases. Boston, Chicago: Butterworths; 1976. Croucher R, Marcenes WS, Torres MC, Hughes F, Sheiham A. The relationship between life-events and periodontitis. A case-control study. J Clin Periodontol 1997;24:39-43. Genco RJ, Ho AW, Kopman J, Grossi SG, Dunford RG, Tedesco LA. Models to evaluate the role of stress in periodontal disease. Ann Periodontol 1998;3:288-302. Rivera-Hidalgo F. Smoking and periodontal disease. Periodontol 2000 2003;32:50-8. Boyapati L, Wang HL. The role of stress in periodontal disease and wound healing. Periodontol 2000 2007;44:195-210. AbuAlRub RF. 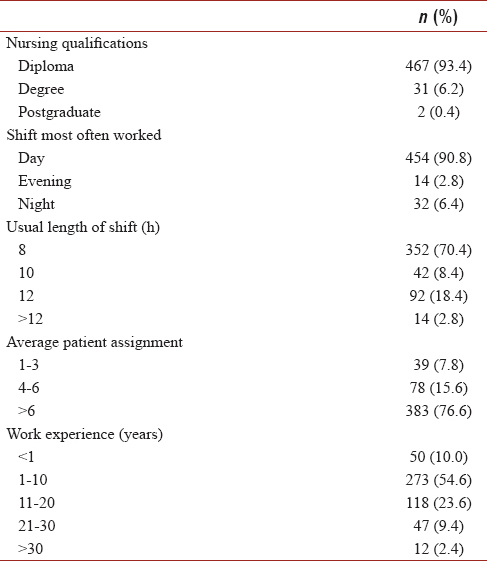 Job stress, job performance, and social support among hospital nurses. J Nurs Scholarsh 2004;36:73-8. Akhter R, Hannan MA, Okhubo R, Morita M. Relationship between stress factor and periodontal disease in a rural area population in Japan. Eur J Med Res 2005;10:352-7. Linden GJ, Mullally BH, Freeman R. Stress and the progression of periodontal disease. J Clin Periodontol 1996;23:675-80. Wimmer G, Janda M, Wieselmann-Penkner K, Jakse N, Polansky R, Pertl C, et al. Coping with stress: Its influence on periodontal disease. J Periodontol 2002;73:1343-51. Ng SK, Keung Leung W. A community study on the relationship between stress, coping, affective dispositions and periodontal attachment loss. Community Dent Oral Epidemiol 2006;34:252-66. Axtelius B, Edwardsson S, Theodorsson E, Svensäter G, Attström R. Presence of cortisol in gingival crevicular fluid. A pilot study. J Clin Periodontol 1998;25:929-32. Houtman I, Jettinghoff K. Raising Awareness of Stress at Work in Developing Countries: A Modern Hazard in a Traditional Working Environment. World Health Organization Publications. Available from: http://www.who.int/occupational_health/publications/raisingawarenessofstress.pdf. [Last assessed on 2011 May 12]. Chang EM, Hancock KM, Johnson A, Daly J, Jackson D. Role stress in nurses: Review of related factors and strategies for moving forward. Nurs Health Sci 2005;7:57-65. Mojoyinola JK. Effects of job stress on health, personal and work behaviour of nurses in public hospitals in Ibadan metropolis, Nigeria. Ethno Med 2008;2:143-8. Kane PP. Stress causing psychosomatic illness among nurses. Indian J Occup Environ Med 2009;13:28-32. Bhatia N, Kishore J, Anand T, Jiloha RC. Occupational stress amongst nurses of two tertiary care hospitals in Delhi. Australas Med J 2010;3:731-8. Watson R, Gardiner E, Hogston R, Gibson H, Stimpson A, Wrate R, et al. Alongitudinal study of stress and psychological distress in nurses and nursing students. J Clin Nurs 2009;18:270-8. Kumar D. Nursing for the Delivery of Essential Health Interventions. Available from: http://www.whoindia.org/LinkFiles/Commision_on_Macroeconomic_and_Health_Nursing_for_the_delivery_of_essential_health_interventions.pdf. [Last. [Last accessed on 2011 Jun 06]. Nizami A, Rafique I, Aslam F, Minhas FA, Najam N. Occupational stress and job satisfaction among nurses at a tertiary care hospital. J Pak Psychiatr 2006;3:25. Olofsson B, Bengtsson C, Brink E. Absence of response: A study of nurses' experience of stress in the workplace. J Nurs Manag 2003;11:351-8. French SE, Lenton R, Walters V, Eyles J. An empirical evaluation of an expanded nursing stress scale. J Nurs Meas 2000;8:161-78. Kumar N, Shekhar C, Kumar P, Kundu AS. Kuppuswamy's socioeconomic status scale-updating for 2007. Indian J Pediatr 2007;74:1131-2. Cohen S, Kamarck T, Mermelstein R. A global measure of perceived stress. J Health Soc Behav 1983;24:385-96. Cohen S, Tyrrell DA, Smith AP. Psychological stress and susceptibility to the common cold. N Engl J Med 1991;325:606-12. Shah M, Hasan S, Malik S, Sreeramareddy CT. Perceived stress, sources and severity of stress among medical undergraduates in a Pakistani medical school. BMC Med Educ 2010;10:2. Amr M, Hady El Gilany A, El-Hawary A. Does gender predict medical students' stress in Mansoura, Egypt? Med Educ Online 2008;13:12. Purcell SR, Kutash M, Cobb S. The relationship between nurses' stress and nurse staffing factors in a hospital setting. J Nurs Manag 2011;19:714-20. Shen HC, Cheng Y, Tsai PJ, Lee SH, Guo YL. Occupational stress in nurses in psychiatric institutions in Taiwan. J Occup Health 2005;47:218-25. 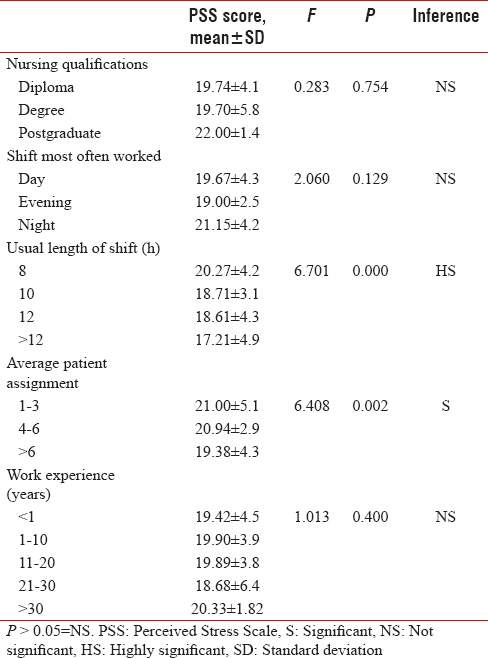 ALnems A. Nurses' Perceived Job Related Stress and Job Satisfaction in Amman Private Hospitals. Available from: http://www.faculty.ksu.edu.sa/msawalha/Documents/My%20publication.pdf. [Last assessed on 2011 Jun 06]. Sveinsdóttir H, Biering P, Ramel A. Occupational stress, job satisfaction, and working environment among Icelandic nurses: A cross-sectional questionnaire survey. Int J Nurs Stud 2006;43:875-89. Sharifah Z, Sharifah Z, Afiq IM, Chow CY, Sitisara D. Stress and its associated factors amongst ward nurses in a public hospital Kuala Lumpur. Malays J Public Health Med 2011;11:78-85. Hamaideh SH, Mrayyan MT, Mudallal R, Faouri IG, Khasawneh NA. Jordanian nurses' job stressors and social support. Int Nurs Rev 2008;55:40-7. Online since 28th February 2018.